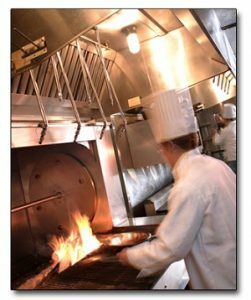 Whether you run a diner, a chain restaurant, or a high-end eatery, here is how you can make sure fire protection is a top priority in your establishment. Now that summer’s here your restaurant is going to start filling up with more customers. Your cooks and chefs are going to be working extra hard to ensure that everyone is satisfied. Whether you run a diner, a chain restaurant, or a high-end eatery, here is how you can make sure fire protection is a top priority in your establishment. You will need to have a fire suppression system installed in your kitchen. Most of the time, fires in restaurants happen in the food preparation area and are caused by stoves, ovens, microwaves – anything with a heating element. The automatic fire suppression systems will use special chemicals to extinguish fires will also temporarily stopping the flow of gas or electricity, whichever energy source is used to power the equipment. Inspections and maintenance are crucial for preventing any malfunctions that lead to fires. Thus, they’re a vital part of any good fire protection plan. Inspections can determine if anything is wrong and then maintenance can be completed to prevent future problems affecting your restaurant. Verify that you have as many fire extinguishers as you need. Several need to be posted in the kitchen or other food preparation areas, but you should also keep some in the dining areas or by the front lobby. You will need the Class K fire extinguishers in the kitchen, and also Class A, Class B, and Class C for other parts of the building in case of electrical fires or kitchen fires that start to spread. One of last part of ensuring you have the most comprehensive fire protection for your restaurant possible is to make sure that all your warning lights, fire alarms, and smoke alarms work. You should also make sure that nothing is wrong with your fire doors or emergency exits. Think about where customers and employees will gather in the event of a fire. Don’t let the back lights for emergency signs go out – at the end or beginning of every month make sure they are properly inspected and repaired if they are not working as they should. If you want to ensure your home and business are safe throughout the year, trust Judd Fire Protection, LLC. We have over two decades of experience in designing, installing, inspecting, and repairing residential and commercial fire protection systems. We serve clients throughout Maryland, Pennsylvania, Washington, D.C., Virginia, and West Virginia. If you are interested in finding out more about our services and protecting your home and business, give us a call at 410-871-3480 or contact us online. For more fire safety tips, follow us on Facebook, Twitter, and Pinterest. This entry was posted on Friday, June 8th, 2018 at 3:12 pm. Both comments and pings are currently closed.